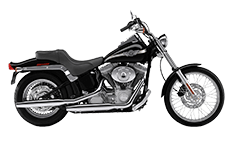 As part of Harley Davidson's vintage line of Softail motorcycles, the Standard model stands apart as a true beauty. Pairing this machine with anything other than thoughtfully designed and carefully planned saddlebags would be a tragedy, and we understand this. We offer you an exclusive collection of Viking Bags for the Softail Standard bikes, each with their own unique branding of the leather manufacturer's signature touch. From studded to plain bags, riders can find everything they need in a portable luggage carry-all here in our online store.